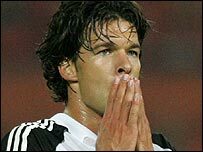 Manchester United boss Alex Ferguson says he will not make a bid for Bayern Munich midfielder Michael Ballack, 28, before next week's transfer deadline. Ferguson says no-one will join before 31 August and is focusing on grooming Alan Smith to succeed Roy Keane. "There will be nothing before the transfer window," he confirmed. "Roy sees characteristics in Alan that he saw in himself as a young player, which could help Alan develop into a very good player in that position."